Depart Los Angeles for Cambodia -Siem Reap. Arrive in Siem Reap and transfer to hotel for rest. 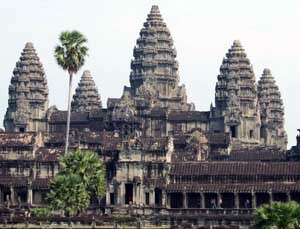 After breakfast spend the morning on an extensive tour of the magnificent 12thcentury Angkor Wat. Lunch at local restaurant. Afternoon continue to explore the Grand Circuit taking in the temples of Pre Rup, East Mebon, Neak Pean and Preah Khan. Dinner at local restaurant. watch the sun set at Phnom Bakheng. Dinner at local restaurant. Overnight in Siem Reap. After breakfast at hotel. visit Banteay Srei, and Banteay Samre tour, Landmine Museum of Mr. Aki Ra. Lunch at local restaurant. In the afternoon continue to Sras Srang, Banteay Kdei, the fabulous Ta Prohm Temple, embraced by the roots of enormous fig trees and gigantic creepers and the small twin temples of Chau Say Tevoda and Thommanon. Dinner with Cambodian Traditional dance show (Apsara dance). Overnight in Siem Reap. Lunch at local restaurant , enjoy a short walk through a tranquil and typical Siem Reap neighborhood before continuing to Tonle Sap Lake to board a local boat for a cruise through the floating villages (best from July to February). Return to the city, visit the workshops of Artisans d’Angkor (wood and stone carving) Lunch at local restaurant. After Dinner, transfer to airport for Homeward flights. ※ Regional English speaking guide on travelling days. ※ Sightseeing and entrance fees as indicated in the itinerary on traveling days. ※ Cambodia Visa: Landing visa with one photo ,with USD$25, apply upon arrival。or apply online before arrival with USD $ 28 http://www.mfaic.gov.kh/evisa/.